Featuring OLED Halos and Daytime Running Lights! Let�s face it. Your factory headlights are plain, boring, and begging to be replaced. You see some of these new cars with brilliant looking projector headlights. You wonder why your truck came with the basic run of the mill headlights you ended up with. This is where RECON comes to the rescue. Recon Projector headlights will make your vehicle stand out from the crowd. 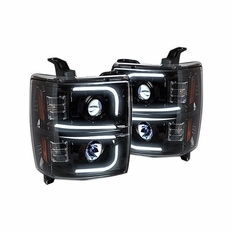 RECON�s Projector Headlights were designed by the engineers at RECON, who are truck enthusiasts themselves. They know what your factory headlight assemblies are lacking, and they�ve come up with unique solutions that give a luxuriously sporty look, and set your vehicle apart from the rest of the pack. RECON Projector Headlights are 50 state street legal and manufactured to the highest standards, meaning that you won�t be sacrificing durability or functionality when running your RECON Projection Headlights. The part number for these RECON Projector Headlights is 264296BKC and they fit 2015-2017 Chevy Silverado 2500 / 3500 (Clear/Chrome) models.